We will now be accepting bookings for the Arundel Pilgrimage until 19th July. Day pilgrims don’t have to book, but it’s useful to know to expect you (and meals MUST be pre-booked). The two-week pilgrimage works its way from the north of the diocese to the cathedral at Arundel, visiting much of the diocese on the way. Our pilgrimage to celebrate 50 Years of the Arundel & Brighton Diocese and join the Festival 50 celebrations at the Amex Stadium near Brighton was completed successfully. You can see details with photos on the diary page which will probably grow over coming days as new photos are received (if you have additional photos please let us know and we’ll add them). If you were a pilgrim on this pilgrimage, we’d love to hear about your experience (good and not so good) – leave a public comment here or send a private message. Friday 3rd of July Day One. 08:30 to 09:15 Registrations at the Cathedral Centre, Arundel. Bring luggage to the pilgrimage transport van. 09:30 to 10:30 Pilgrim Commissioning Mass at Arundel Cathedral led by Bishop Richard Moth. 10:40 – Process through Arundel with banners. 18:00 to 18:20, Gathering at Bramber Church. 18:20 Procession through Bramber and Upper Beeding to the Towers. 17:00 – 17:20 Gathering at Stanmer Park. 10:00 Depart with banners to the Amex Stadium. Application forms and posters can be found on the Diocesan website in the festival section. Booking Form here. There is also a poster to download as well if you wish here. Bookings accepted until 16th June with FULL PAYMENT, subject to availability. 40 years ago today, 12 April 1975, some 25 pilgrims led by Bill Haynes and Bob Garrard had just finished their penultimate day of the Holy Year Pilgrimage around Arundel and Brighton Diocese. Today, over 40 pilgrims have just returned home from Farnham (from where that pilgrimage was masterminded) having gathered to celebrate 40 years of our walking pilgrimages. Together with many current pilgrims (of varying vintages) we welcomed Gil Haynes (Bill’s widow) and Bob Garrard, representing the start of the pilgrimages, several couples who met on pilgrimage, and some “next generation” young pilgrims. Current coordinator Ceri had taken on the organisation, and the relaxed and peaceful gathering reflected her calm approach to running things (though I’m sure there was lots of unseen activity backing this up). Alison excelled in the kitchen, assisted by Clare (who also provided a stunning cake featuring many of the pilgrim crosses) and Gil (who provided welcome liquid refreshments). The reunion walk, led by Aidan and Bridget, was blessed by fine weather (after a dodgy start) and lovely countryside, a micro brewery, a super-efficient (if pricey) lunch pub and 2 prayer stops. (It also passed the former homes of at least 10 pilgrims past and present, not marked by blue plaques). Back at St Joan’s, Farnham, we celebrated our history in prayers and music, including a procession of pilgrimage crosses and a roll call of deceased pilgrims. This was followed by the slideshow, supper and a traditional sing-song. You can see the reunion diary with pictures (more pictures will be added as I receive them). Pilgrims who journeyed with us in the 1980s and early 1990s will remember Alan and Eileen Fox. Alan has been in touch with the sad news that Eileen completed her earthly pilgrimage on 22 January 2015. Please keep Eileen, Alan and their family in your prayers. It has taken us a bit longer than intended, but the autumn edition of the pilgrimage newsletter is now available via this direct link. There’s lots to read over the Christmas holidays, just get the dates in your 2015 calendar now! Best very wishes for a blessed Christmas and a rewarding 2015. 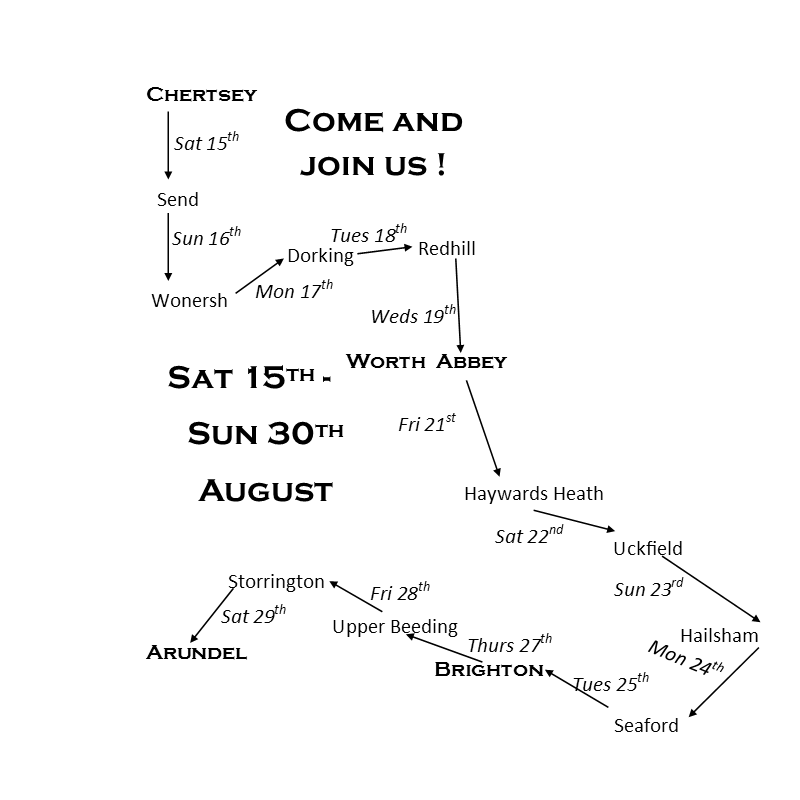 Our annual 2 week walking pilgrimage, The Arundel Pilgrimage 2015 this year runs from Saturday August 15th to Sunday 30th August 2015. Bookings now closed, but no booking is required for day pilgrims. The pilgrimage is celebrating its 40th anniversary! The first pilgrimage was made in 1975 to beat the bounds of Surrey and Sussex in celebration of the 10th anniversary of the Diocese of Arundel & Brighton and this year we return to our roots in thanksgiving and prayer. We will cover about 180 miles visiting very many deaneries of the diocese, starting in Chertsey and finishing at Arundel Cathedral. The route is currently being finalised and our will be published shortly. Come and join us as each day we joyfully walk together in faith and fellowship as an ecumenical Christian community, recognising our shared Christian mission to know and to serve the Lord and to witness to God’s love for all people. Pilgrims can join for the whole way , a week or a collection of days. We should have space for 100 pilgrims, so get in fast to avoid disappointment. Our 2014 Pilgrimage reunion took place near Manchester, 31st October to 2nd November 2014 and was attended by a select group who enjoyed hospitality and a great walk. Follow this link to the Reunion Diary Page to see what you missed, and save the date of next year’s 40-year reunion for anyone who’s joined us in the past or is thinking of joining us in the future. “Blistering Years”, a term coined at our 20th anniversary in 1995, is our name for the potted histories of our pilgrimages. They’ve just been brought up-to-date and can be found here. This page includes links to diaries of all of our pilgrimages over 40 years – somewhere for old hands to reminisce and future pilgrims to see what we’re really like.